December 12th inspirational speaker and published author Sheryl Roush was interviewed AGAIN by popular Family Network personality Lorri Allen and veteran newsman Larry Estepa for Mornings! Ms. Roush was asked to share about the new music CD added to her Heart of the Holidays book, featuring child prodigy pianist at age 16, Laurie Z., 15-time Grammy award nominee consideration artist. The selections, chosen by Janet Cucinotti of Zebra Productions, Inc., offers traditional and lively Hanukkah and Christmas songs. Lorri Allen is featured with FOUR of her own stories published in the Heart of the Holidays book! Copies were given away to callers who phoned in to share their favorite holiday traditions. "Mornings" is like a chat around the water cooler. It’s a fun, refreshing—but different—way to start the day, equipping listeners with ways to engage friends and co-workers. Informational and inspirational, it’s relationship radio at its best. "Mornings" airs live on SIRIUS Satellite Radio Channel 161 from 6:00-9:00 am ET and on FamilyNet TV from 7:00-9:00 am ET. Check out the Mornings Blog anytime. Heart of the Holidays (book only) is available at Amazon.com, Borders.com, and Borders bookstores (find location near you). Order the Book with Bonus Music CD for $19.95 and receive the Sparkle-Tudes! A-Z Quotations eBook (value $14.95) free. Sheryl Roush is President of Sparkle Presentations, Inc., based in San Diego, California. She is a top-rated international conference speaker, and 12-time author. In additional to Heart of the Holidays, her other books include: Heart of a Woman, Heart of a Mother, Heart of a Woman in Business, Corazon de Mujer (Heart of a Woman in Spanish), and Sparkle-Tudes! 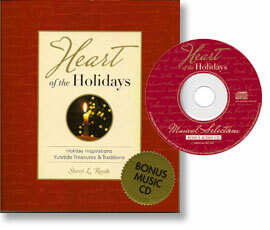 Heart of a Mother also has a Bonus Music CD available with the book. « The Price is Right! This entry was posted on Tuesday, December 16th, 2008 at 11:24 pm	and is filed under Christmas, Heart of the Holidays, Interviews. You can follow any responses to this entry through the RSS 2.0 feed. You can leave a response, or trackback from your own site. THANK YOU! You were fabulous–just the shot of energy we needed this morning!